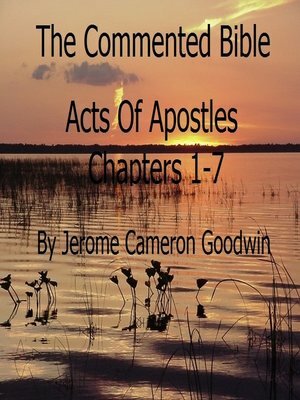 The Commented Bible – Book 44A – Acts of Apostles", is 1st in a series of writings on the Acts of Apostles, entitled, Keep On Bearing Witness To The Truth, in 4 parts. This book in the series is Part 1, and it covers the Bible book of Acts of Apostles Chapters 1-7. It is 293 pages in length and will serve as a learning tool and continuing study reference throughout one's life. It is a valuable reference for Christians who want to study deeply the true teachings of the Bible, which writings are the basis of all true faith. It is designed for the layman, and does not require any pre-existing knowledge of the Bible to properly understand it. It is designed to be a simple and effective means for anyone who is wanting to know accurately what the Bible teaches to learn it. It includes much documentary and background information on John's life, and it makes clear all his teachings, by showing all pertinent cross-reference information from the rest of the Bible record. After reading it you will know the truth, and will be able to express your faith with confidence and accuracy on any part of John's writings. God's word is truth!